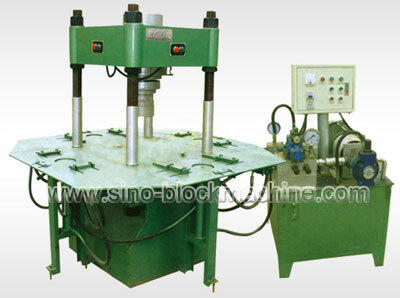 SINOSUN 150T Four-Post Hydraulic Block Forming Machine is a newly designed model. It is also specially designed to make high intensity, high density paving blocks and curbstones. It has four working platforms. Four operators can work at the same time, higher capacity. 150T Four-Post Hydraulic Block Forming Machine has big pressure. The pressure can reach 31.5Mpa. So the curbstones it made have very good quality, higher than many countries’ standard. Paving blocks made by it have excellent performance, long life. It can make many sizes, many patterns pavers and short curbstones. The curbstones length is less than 500mm. Pavers made by it are of higher intensity, density and strength. They are more competitive than those made by common block machine. 150T Four-Post Hydraulic Block Forming Machine consists of main machine, one upper mould, four lower moulds, hydraulic station, joysticks and four working platforms. Application: suitable to produce curb stones and different kinds of paving bricks.